A 43 year old woman in Northern Ireland is serving her 31st prison sentence. The woman, who is currently imprisoned at Hydebank Wood on an assault charge, is Northern Ireland's fourth most 'prolific' prisoner. New Prison Service figures show that only three other inmates, all male, have been in and out of prison more frequently. Between them the men have nearly 100 separate periods of custody on their prison records. The three males, whose ages range between 28 and 35, are also serving sentences in relation to assault charges. Of 1,421 people in prison in Northern Ireland, 27 inmates (26 males and the aforementioned female) have each been in and out of prison more than 20 times. The Prison Service figures also show that the oldest person in prison in Northern Ireland at present is a 78-year-old male. 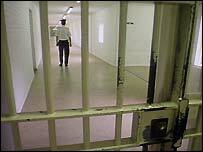 A total of 176 people in Northern Ireland are currently behind bars having been convicted of murder.